In addition to evoking feelings of surprise and disgust, cockroaches are also a major health concern. They can spread disease, contaminate food, trigger allergies and even cause asthma symptoms. In fact, cockroaches are known for their ability to transmit harmful pathogens like E. coli, Salmonella spp. and typhus, plus viral diseases such as poliomyelitis. But of course, cockroaches aren’t concerned with your health. They’re eager to invade your space, slipping through cracks and spaces as small as 1/6 of a centimetre wide. And once they’re in, they can begin reproducing rapidly. Before you’re even aware of these unwanted visitors, they may have started multi-generational family in your facility. Want to know more ways to prevent cockroaches? 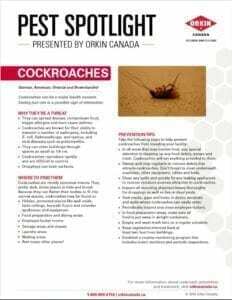 Download our Cockroach Pest Spotlight for expert tips on how to keep these nuisances outside.